Gonzo’s Quest comes to us from Net Entertainment and has grown in popularity over the years, becoming one of the most played online video slot games of all time. This fantastic slot was among the first to have some of the most advanced and highly innovative features, which are still being used today in some very recent releases. This game tells the tale of Gonzo, the lead character in this video slot, and his quest to find Eldorado, a mythical city all made of gold, whose location remains a big mystery. 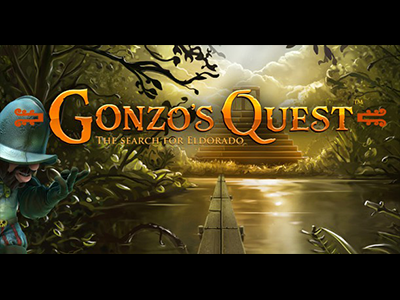 Gonzo’s adventure, which is the theme of this game, is finding Eldorado. When playing this 20 pay line game with increasing multipliers up to 15x (!) you will be helping Gonzo on his hunt for the golden city and his treasure, and along the way you too may find your own treasure! The bonus feature, although it is quite hard to trigger, has to be one of the most exciting bonus features around and can award huge wins. This slot game’s main feature is the very unique “Avalanche Reels”, invented by NetEnt and which changed the entire manner of playing slots. Avalanche Reels helps you make more winning combos while you’re playing. During this feature, whatever symbols create a winning pay line, suddenly light up and vanish down below the ground, so the reels have room for another avalanche, putting new reels there to give you another chance at winning. Everyone loves this feature because it does give you a second chance to win so you don’t get discouraged since you know you have another win on the way. This slot has many more features as well. You get more chances with the Wild and Bonus symbols which do pop up on the reels. A Question Mark serves as the Wild symbol and it substitutes for all the other symbols in creating winning combos. The Question Mark also vanishes to trigger the Avalanche Feature, just like the others do, giving you more chances to add to your coin collection of winnings! The “Free Falls” Bonus wins you some free spins. When the Scatter pops up this sets off the Free Fall and you need to have 3 or more of the Golden Icons pop up to win 10 Free Falls. While playing this round you will get a 3X multiplier tacked onto each of your wins, plus you have the possibility of getting a 6X, 9X or 15X multiplier as well. When the Free Falls round ends you will see Gonzo catching all the winnings in his hat. How cute is that? Gonzo’s Quest is a fantastic video slot, jam-packed full of additional bonus rounds and very innovative features that have lasted the test of time since they’re still used in the most recent video slot releases. While playing Gonzo’s Quest we came to love the character Gonzo because as the game unfolds the players get involved in his quest and desire to find Eldorado. And in the end, when Gonzo finally gets his treasure, you do too! This is a very clever game and we recommend it very highly.